Fowler & Hammer, Inc. is committed to creating a safe work site for our employees, subcontractors, clients, and general public on all of our construction projects. Our health and safety program establishes policies and guidelines to assist in the prevention of occupational injuries and illnesses. We believe that the prevention of injuries is essential to all business functions and every employee has the responsibility to maintain this commitment to safety. The safety director, project managers, superintendents, and subcontractors are all involved in the pre-planning process before construction begins. Topics such as risk management, basic safety reminders, and dangers specific to the job are discussed in detail in order to minimize potential hazards and ensure a safe working environment. Regular site inspections and safety meetings are personally conducted by the safety director to identify and minimize developing risks and exposures. Additionally, individual issues are addressed with site personnel and project managers as needed. Fowler & Hammer, Inc. employs a full-time Safety Director to lead our staff in the training and execution of our award winning safety standards. Regular jobsite safety talks given by the Safety Director give employees a chance to discuss topics relating to the changing hazards of current work environments. Fowler & Hammer, Inc. believes in providing consistent, continuous training has a tremendous impact on the safety habits and culture of our organization. The Association of General Contractors, Union trainers, and our own Safety Director all work as a team to deliver the appropriate training materials to employees. On-site training is utilized for specific hazards in order to reach key individuals in the ever changing work environment. Fowler & Hammer, Inc. distributes a weekly safety newsletter in order to deliver a relatable safety topic and review any near misses or safety related incidents. Fowler & Hammer, Inc. believes that providing consistent, continuous training has a tremendous impact on the safety habits and culture of our organization. 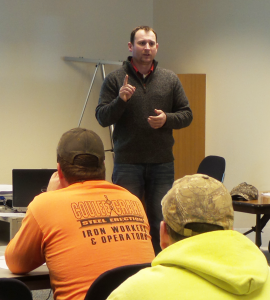 The Association of General Contractors, Union trainers, and our own Safety Director all work as a team to deliver the appropriate training instruction and materials to our employees. On-site training is utilized for specific hazards in order to reach key individuals in the ever-changing work environment.